Building To Teach enables students to learn math through hands-on projects: opening the door to higher education and better jobs. Building is a natural use of math. Building To Teach is an experiential learning program that uses the building process to excite students about math and teach them the math skills they need to pursue jobs in math-related fields like construction, accounting, engineering and computer science. The Building To Teach approach is founded on experience with students who have not only improved their math skills, but come to realize that math can be useful to them, through collaborative building projects that are engaging, challenging and rewarding. 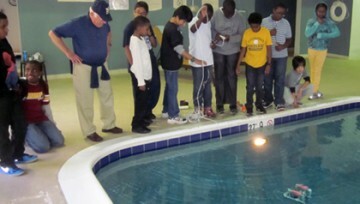 Our results-oriented, hands-on teaching methods have been developed and refined over 18 years at the Alexandria Seaport Foundation (ASF) in Alexandria, VA, where young people learn practical math through boat building. Meet the Director, Joe Youcha. In 2017 (academic), over 700 instructors from 44 states and 16 countries participated in online/ digital B2T instruction and served approximately 12,500 students. Using pre- and post-tests since 2015, a sample of 1,000 students shows an average increase of 25.5% in measured math skills. Is Building To Teach Being Used in Your State?